Feels a bit weird waking up and knowing Arsenal aren't involved in any football this weekend and we're going to have to wait until Monday night to see the team play. It's a long time since we played on a Monday, mainly due to our involvement in the Champions League. And with that competition taking a back seat until February after the draw next Friday, Arsenal are now free to play on whatever day the TV companies choose. So it's Monday night at Old Trafford. 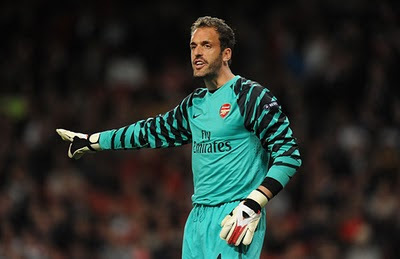 One player Arsene Wenger has said won't be involved in the squad is Manuel Almunia. The Spaniard hasn't been seen in an Arsenal shirt since his 45 minutes for the reserves against Wolves on November 23. His "elbow injury" is still troubling him but the manager told Arsenal TV Online that the goal keeper was days not weeks away from being able to play again. However it has since transpired that Almunia has received an offer from a club in Qatar which would allow him to play first team football. "We have still not finished negotiations, but it is clear that Manuel wants to return to Spain." Malaga is the latest Spanish club linked with the keeper. But it's clear to me that Almunia could be on his way in January. I don't think we'll see him in an Arsenal shirt for the first team again. At this stage of his career he'll want to play first team football and a move away from the club seems the best way of securing that. Personally I believe he should have been offloaded in the summer. All the transfer rumours of Mark Schwarzer, Manuel Neuer and Pepe Reina didn't help his confidence. Which is why I would have handed the gloves to Lukasz Fabianski from the start of the season. As we head towards Monday's game, it appears that the 36 hours prior to kick off is when Cesc Fabregas will have to decide whether he is fit enough to make the journey to the north west. The captain has been putting in extra training sessions in a bid to be fit. And the manager will give him until Sunday morning to get himself in the best possible state to be ready. "We could have him back, but there is a very big uncertainty as to whether he will be in the squad or not. That will be decided very late." If Cesc is fit it will be an obvious boost. His presence in the team seems to lift the other players. But even if he doesn't play we still have a good chance of winning the match. Our away form has been excellent this season in the league. Theo Walcott has been talking about getting a start. I thought he was unlucky not to have been picked from the off against Partizan. However I believe he is now very much knocking at the manager's door asking for a chance to start. "It is always frustrating being on the bench, ask any player – it is not just me. "But it comes to the point when you do not want to dwell on it all the time. You just want to come off the bench, show what you can do and try and get back in the team. "And this season, I have come back [from injury] and the team has been playing well and winning so that is difficult to get back in . Hopefully, I have shown what I can do." Against Partizan he looked much better than in recent performances. I'm sure the manager is debating with himself if Walcott should start. But the bigger question is, if you do start Walcott - who do you drop? Some early team news. Arsene Wenger, in his pre-match interview with Arsenal TV Online, says Abou Diaby won't be ready for the game and that Kieran Gibbs is out for three weeks. Gael Clichy returns after being sick for Wednesday night's game and Johah Djourou will be available after his thigh injury. The manager will host his pre-match press conference later. We'll get more team news then no doubt.